DuaneSimolke.Com, Blog from Lubbock, Texas, Author Duane Simolke. This week, site suggestions, book suggestions, a gay comedy, and some boy from Hell. A friend just introduced me to the site Good Reads; it helps you find and suggest books. Find links to some similar pages—and numerous gay sites—via my Link Trades page. I loved the book Weird Texas! I just started reading Weird U.S., and it has some good stories so far. The concept is simple: combine first-person reports of local folklore and urban legends with road-trip investigations. It should appeal to fans of the TV show Supernatural. SciFi Wire includes an interview with Hellboy 2’s Doug Jones. That sequel looks it might be even more fun than the original. The gay comedy A Four Letter Word arrives on DVD, August 14. It stars actor/OUT columnist Jesse Archer and Dante's Cove hunk Charlie David. (As opposed to all the ugly people on Dante’s Cove.) Read my review at ThisWeekInTexas.Com. In my novel Degranon: A Science Fiction Adventure, gay marriage is a non-issue, and racism is a distant but painful memory. Unfortunately, people now face discrimination for their weight, as well as for their religious and political views. In science fiction, like in reality, we always need to struggle against prejudice. Some news about scifi TV follows. In a video at the ABC Family Kyle XY page, the narrator simply gives 2009 as the return date. The same page says “ALL NEW SEASON coming soon!” Soon? Fox has posted a Fringe page. At this point, the page only shows strange images from the upcoming Joshua Jackson series. SciFi.Com has posted new details about the syndicated series based on Terry Goodkind’s Sword of Truth novels: Wizard's Gets Show Runner. SciFi.Com also posted Battlestar Galactica clarifications; the clarifications might cause more confusion. We’ll see what the future holds; if the rest of the season proves anywhere near as good as that midseason finale, viewers should stay tuned. More Gay Love and Marriage Buzz. Opinions and More: The California gay-marriage decision - more comment. 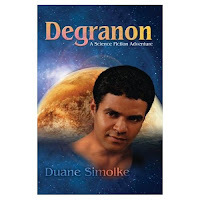 This revised version of Duane Simolke's science fiction adventure Degranon features more gay characters and a sharper focus on diversity themes. On the planet Valchondria, no illness exists, gay marriage is legal, and everyone is a person of color. However, a group called "the Maintainers" carefully monitors everyone's speech, actions, and weight; the Maintainers also force so-called "colorsighted" people to hide their ability to see in color. The brilliant scientist Taldra loves her twin gay sons and thinks of them as the hope for Valchondria's future. Some Gay Marriage Buzz, During the Big Day in California. BTW, this is blog entry #350 for Acorn Universes. About.Com has posted 2008 Gay, Lesbian, Bisexual and Transgender Pride Parade Dates. My video Gay Pride has received 2,595 views at YouTube. "Editing" is a poem about past and present homophobia. This video contrasts the dark imagery of "Editing" with colorful, positive pictures from Toronto Gay Pride, showing a refusal to let fear, violence, or hatred silence us. "Editing" appears in my book Holding Me Together, which also includes the essay "Reactions to Homophobia" and the gay love poem "Home." My other videos follow: The Return of Innocence: A Fantasy Adventure, Fight Cancer, Texas Fiction, Gay Science Fiction, and Gay Love Poem. Watch here for news about a new movie (and a new Web site) from Jeff London, director of And Then Came Summer, Regarding Billy, and the gay horror flick When Darkness Falls. Mania has posted a new Babylon A.D. trailer. Vin Diesel stars in the French production, based on a popular science fiction novel of the same name. Mania also posted a Mirrors teaser trailer; that horror film stars Kiefer Sutherland. The new DVD Back Soon is a gay love story with a supernatural twist. And speaking of supernatural and twisted, Dante's Cove: The Complete Third Season just arrived. For another gay love story, Brad Rowe returns in Shelter. SciFi.Com has posted an interview with Robert Wertheimer, executive producer of Charlie Jade. That dimension-spanning series comes to SciFi this Friday. The direct-to-DVD sequel Starship Troopers 3: Marauder arrives August 5. That site includes details, news, and images. The trailer looks promising, and didn’t give me eye-strain—unlike the poorly lit ST2. Terminator: The Sarah Connor Chronicles: The Complete First Season arrives on DVD August 19, while Smallville: The Complete Seventh Season drops September 9; of course, both shows will return to TV in the fall. Queer Writers, a resource for LGBT readers and authors, has relocated. Previous members need to rejoin. Sons of Taldra: A Science Fiction Adventure. In an alternate reality, an Iroquois woman and her twin gay sons battle shapeshifting aliens. The Acorn Stories. “A lush tangle of small-town life branches out in this engrossing collection of short stories.” -Kirkus Reviews. The Acorn Gathering: Writers Uniting Against Cancer. Join the fight against cancer by purchasing this fundraising fiction collection, with stories by Jan Chandler, Shawna R. Van Arum, Huda Orfali, Timothy Morris Taylor, and Bill Wetzel. Now That We’re Grown: A Gay Romance Short Story. Two gay men reunite after college as more than friends, but their past threatens their future together. Degranon: A Science Fiction Adventure. An Iroquois family gets caught in a battle between two oppressive worlds! Holding Me Together counters homophobia, promotes equality, and celebrates life! The Return of Innocence: A Fantasy Adventure blends humor and romance with exciting fantasy action. Stein, Gender, Isolation and Industrialism: New Readings of Winesburg, Ohio examines the best-known work of the influential American writer, Sherwood Anderson.